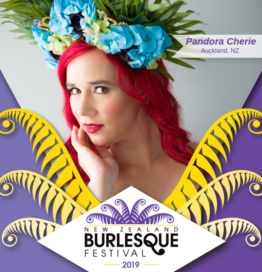 Pandora Cherie is a luscious, enchanting performer, with a little bit of cheeky sass thrown in for good measure. She is fond of both the gory and the glamorous styles, equally at home swanning round with a giant boa, hiding behind feather and silk fans, or ripping the still beating heart from your chest and licking it. A sensual dancer, her moves are both silky and sinuous, creating awe-inspiring performances that will steal your heart away and leave you wanting more.